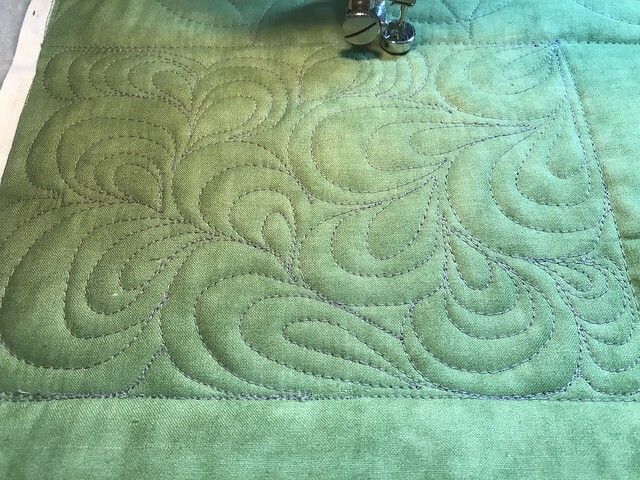 When I started quilting again I was reminded of how much I hated basting. I had 3 tops waiting for quilting just sitting on my shelf in my sewing room. Now I love quilting. Its my favorite part. So one day at the end of May I was day dreaming of purchasing a long arm and playing on Ebay. 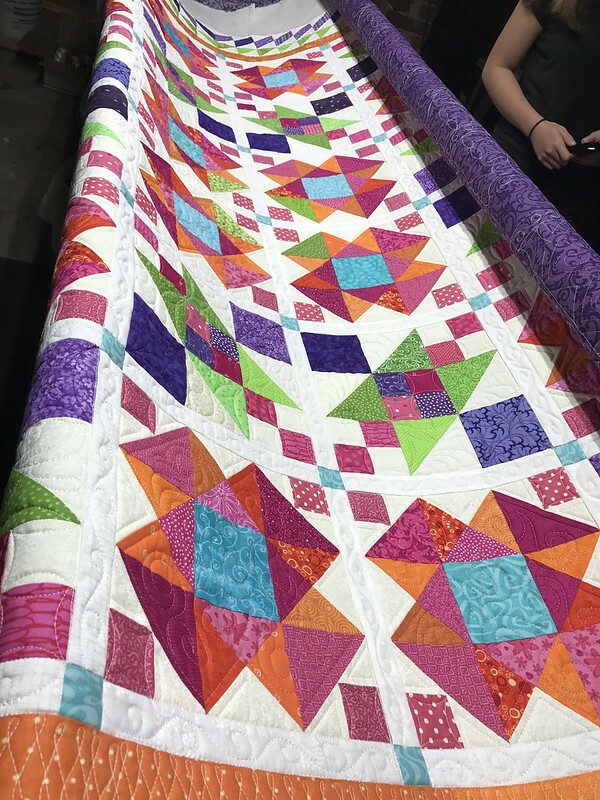 I happened upon a 17" Bailey Home Quilter and 10' frame for a really great price. Brought it up to my husband and told him how tempted I was to bid on it. Being the great supportive husband that he is, he said to go for it. I think he just wanted his quilt finished and was tired of helping me baste. (and listening to me complain about it). So I went for it. Ended up buying it and having it shipped to my house. So after a long hot day of assembling the frame I realized something just wasn't right. After more research I found out that the frame, the original Grace Machine Quilter, just wasn't made for a 17" machine. I only had 9" of usable space. I should have realized that maybe there was a reason the seller didn't list the frame model in the ad. I trusted that the machine and the frame worked together since they were being sold together. Silly me. I did email the seller and tell her my displeasure. Her response was that I should have known as other people figured it out. This was my first longarm and frame so I guess I should have done more research. I didn't realize some frames wouldn't allow you to use the bigger machines. Well now I know and will remember it forever. While I feel like she was being a bit dishonest I really should have done more research and not trusted an ebay seller. Plus we were setting this up on my basement floor which isn't really level so we had such a hard time getting this even remotely level. Part of me thinks the frame was a bit warped to start with. Parts of the table didn't fit quite right. The tracks came in pieces so when the carriage would move over the seams I would get very large bumps in my quilting. I was really starting to doubt my purchase and wondered if I had made a mistake. I ordered an upgraded metal carriage to try to see if that would help but in the end it didn't and I was so frustrated. 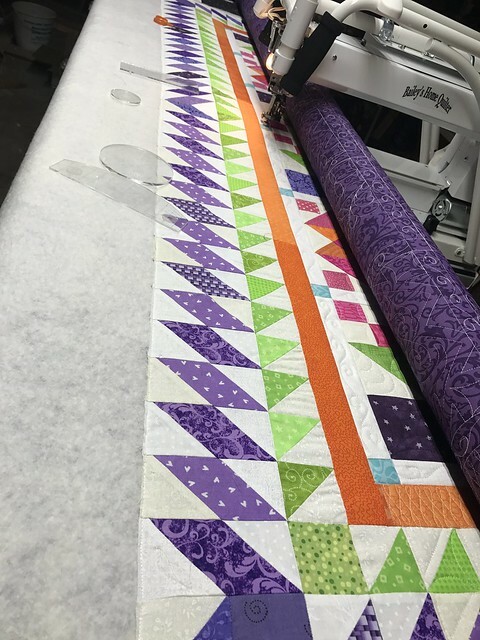 I loved the machine but the frame just wasn't letting me quilt the way I wanted. I could order tracks that came in one piece but I started to realize maybe that wouldn't even help. I still wasn't going to be happy with this frame. A practice piece after the new frame! Looks like it has been awhile since I have posted to my blog! I haven't disappeared completely. Life has gotten in the way a bit. First thing was that we bought a house! We have been here 3 years now. We bought it shortly after my last blog. It's an older house that was built in 1900. So it needs a bit of updating. When we moved in we pulled out a lot of rug and refinished the gorgeous hardwood floors that we found underneath. We still have a bit of remodeling to do to the bathrooms and kitchen. We will get it done someday. The good news is that I have a sewing room now! It's large and spacious and I love it. The next big thing that happened was that I started school again. I am attempting to get my Masters degree in Accountancy. I only have 2 classes left after the one I am in now. I keep needing to take breaks due to other life issues but right now I have a 3.8 GPA so I am happy with that. The program is pretty strenuous. It is a year round program with only a couple week break around Christmas. The classes are one at a time for ten weeks each. A class ends one day and a new one starts the very next day. So there are 5 10 week terms a year. So far I have taken 3 terms off since I have started. We also have a couple new family members. A new kitten, now cat, named, Luna, and a new dog, named Nebula. We are now up to 3 cats and 1 dog and I think we are done on animals. After not having a dog for years it was an adjustment but she is such a wonderfully fun sweet dog. A bit naughty but she is young and has some growing up to do. The cats were not huge fans at first but they have adjusted and will put up with her. Nebula, we call her Nebby, has needed some training so that has been time consuming. She was not completely house trained when we got her and had poor manners. She was 10 months old and I think they didn't do much with her when she was a puppy. We got her from a rescue that transported her from the south to New England. So that being said I took a break from quilting and took up knitting. It was easier to pick up and put back down and easier to transport. 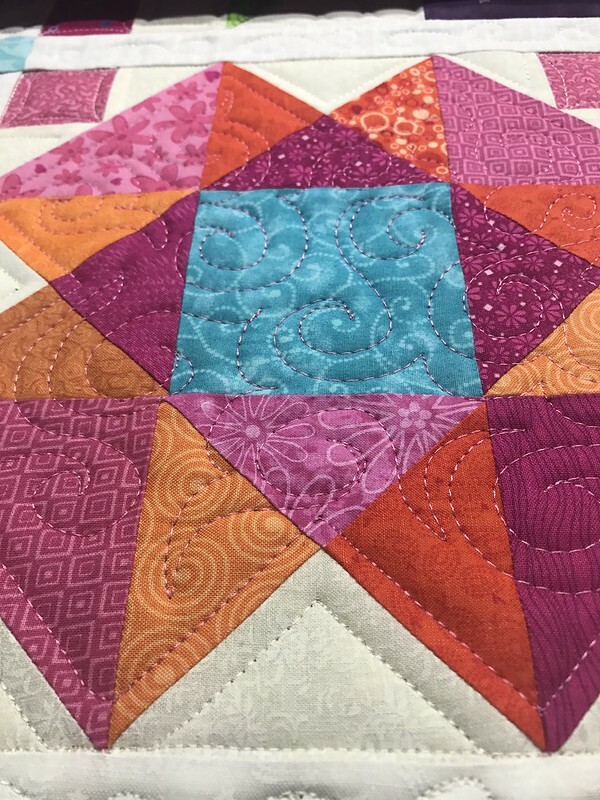 A couple months ago my quilting bug hit again and full force. I have gotten a few UFO's almost done. My Lazy Sunday Mystery by Bonnie Hunter is now done. Its on my couch waiting for the binding. My year to crow about quilt is in top form. Next to be quilted. Also, the big news, is that I picked up a 17" Bailey Home Quilter and Frame last month. That has been a process and a half which deserves its own blog post now that its finally up to my satisfaction. Absolutely love having a long arm. Mostly because I LOATHE basting. 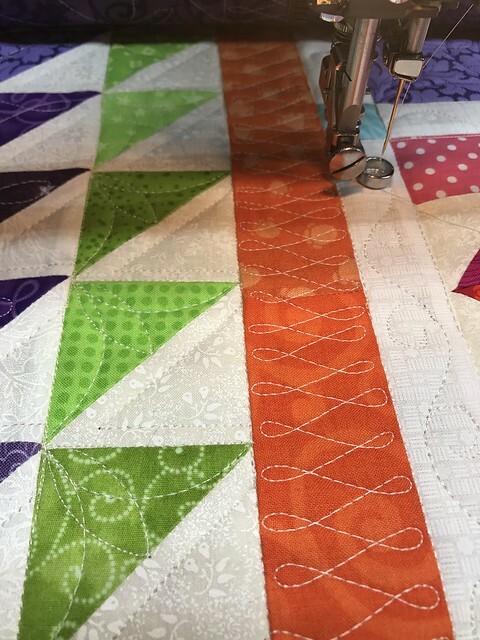 It was such a cumbersome process that made me not want to finish my quilts even though I loved the actual quilting process so much. Anyway more details next time! I really am going to try to start blogging more often.